Fruit smoothie recipes, as the name suggests, contain one or more types of fruit, often yogurt as well as some liquid like juice or lemonade. The fruit smoothies we feature on this page is selected based on taste and is not necessarily intended to be low in carbs, sugar or fat. 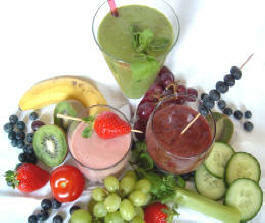 If you are new to smoothie making, we suggest that you read our useful tips in the Smoothies Recipes Guide. Put the ingredients in the order above in the blender. Blend on low speed for 10 seconds and on high speed for 20 seconds. Put the ingredients in the order above in the blender. Blend on low speed for 20 seconds and on high speed for 30 seconds. Put the ingredients in the order above in the blender. Blend on low speed for 10 seconds and on high speed for 30 seconds. Put the ingredients in the order above in the blender. Blend on low speed for 15 seconds and on high speed for 15 seconds. Put the ingredients in the order above in the blender. Blend on low speed for 10 seconds and on high speed for 10 seconds. Put the ingredients in the order above in the blender. Blend on low speed for 15 seconds and on high speed for 30 seconds. Put 5 slices of apples and the diced mango into a blender, drizzle honey over it and add sugar(optional), add the ice and ice cream and then pour in the milk. Blend on low speed for 15 seconds and on high speed for 30 seconds.